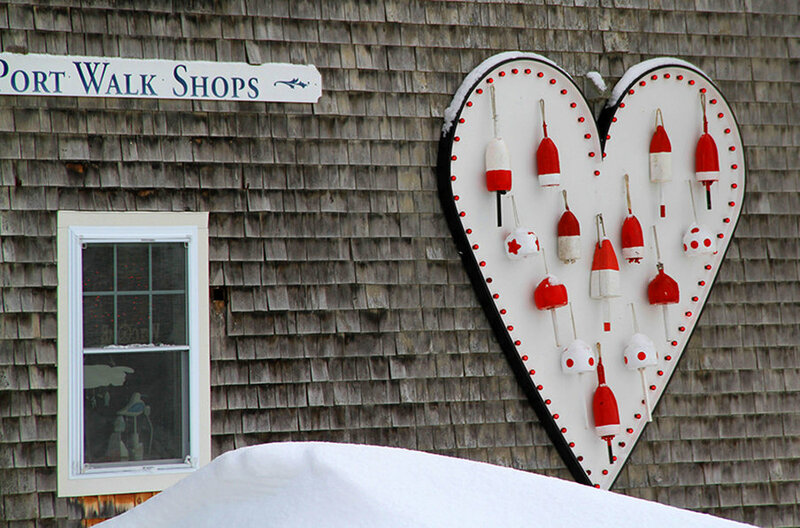 Retreat to the Kennebunks this Winter for a couples getaway. Specializing in Maine getaways for couples, the Port Inn Kennebunk is happy to be your local helping hand and show you the beauty of the Kennebunks in the wintertime. Book your intimate and relaxing accommodations for two, and stay just steps away from the charming village of Kennebunk and just a short drive from downtown Kennebunkport and the Maine beaches. A special Red Bag welcome treat, filled with delicious local artisanal products including red velvet whoopie pies, Maine Root craft sodas, and other romantic Maine-inspired treats. Complimentary local and delicious breakfast each morning. Spend your days touring southern Maine’s beaches and lighthouses, fireside receptions, horse-drawn sleigh rides, cross-country skiing tours, couple’s cooking classes at Stonewall Kitchen Cooking School, and much more in the snowy Kennebunks! In February, the entire town lights up in red for “Paint the Town Red,” a month-long event when restaurants, shops, and other businesses offer special deals and events focused on romance. Attend cocktail classes, evening receptions, and nightly festivals held at downtown establishments and amongst the snowy landscape! Book your romantic couples getaway to Maine today and discover a variety of wintertime activities and local events! Voucher to Pearl Oyster Bar can only be redeemed Wednesday through Sunday. Must be booked at least 2 days in advance. Subject to availability. Can not be combined with other discounts. Based on double occupancy.